When hubby was here for his annual vacation, we managed to dine in at Sam's Pizza a number of times. It's not that we're pizza lovers but we just enjoy the band, the crowd and the ambiance at Sam's. Their chicken in a wicket tastes heavenly as well as their Manager's Special Pizza. What I like most in Sam's is that the place caters to all ages, we could see a mixture of crowd whenever we dine there. Hubby always enjoy his bottles of San Mig Light while watching the hilarious band, it's really a stress reliever after a long day. The stage at Sam's where the band performs is quite close to the audience giving you an intimate bonding experience. They have a complete set of live band instruments and it's always been a pleasure to listen to the band while they perform their specific genra of music. I'm wondering if they're using Gibson Pure Instrument Cables but what our family likes most is the Dzyre band performance. This is a comic band which performs a variety of music. Now speaking of their unbeatable pizza flavors, they have now an ongoing promo, a buy one take one promo which runs from July 1 to Sept 30, 2014. An order of All American Pizza or New York Special Pizza entitles you to a free family size Hawaiian Special Pizza. Hmm...it must be a great treat for all pizza lovers out there. I would certainly love to go back to Sam's and avail this promo. 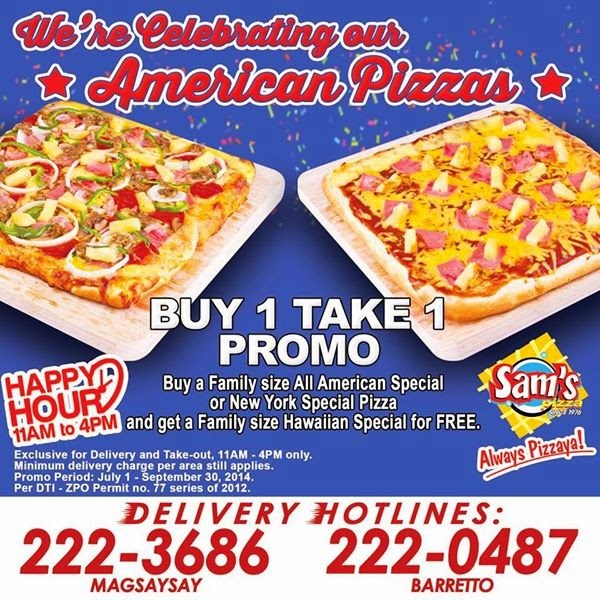 Sam's Pizza Haus is conveniently located at Magsaysay Drive Olongapo City.